Yikes, that title pretty much tells you the whole recipe, huh? But to be honest, I just couldn't decide which ingredients I should highlight, because they all contribute merrily to the dish. I guess I could have included the rosemary, as well. Or the chicken stock. But that would be overkill. Hah. This would be great served over rice or alongside potatoes to soak up the really tasty juices. Or polenta, which doesn't really soak up juices, but it plays well with sauces and gravies. Some crusty bread and a green salad would round it out nicely. 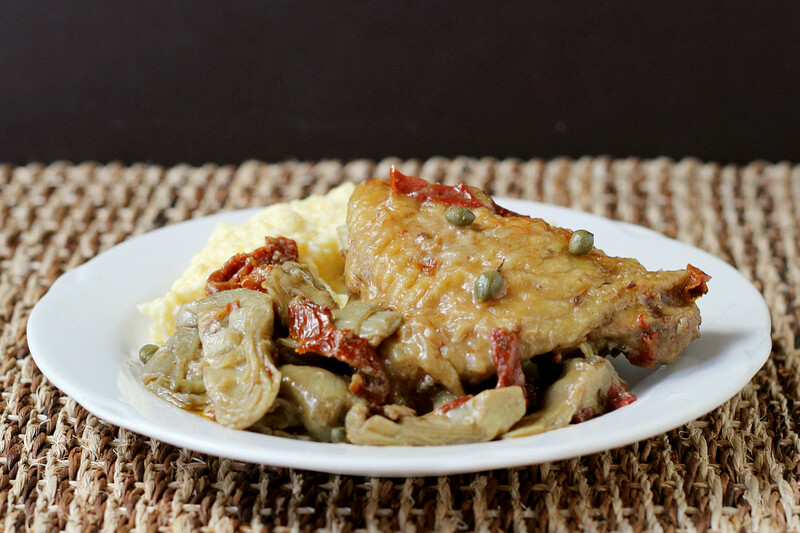 This post is sponsored by Holland House, and I used their white cooking wine for this particular recipe. Actually, I managed to use the whole bottle in a number of different recipes. I hadn't used cooking wine much before these sponsored posts, but I have to say that it's handy to have on hand. Previously, I created a mushroom recipe using red cooking wine. Check it out! It was really good! Besides the red and white cooking wines, the other cooking wines are sherry, marsala, sake, and white wine with lemon. I think I'm going to pick up a few others to try. While white wine is the natural choice for chicken, it also pairs well with pork, veal, or seafood. 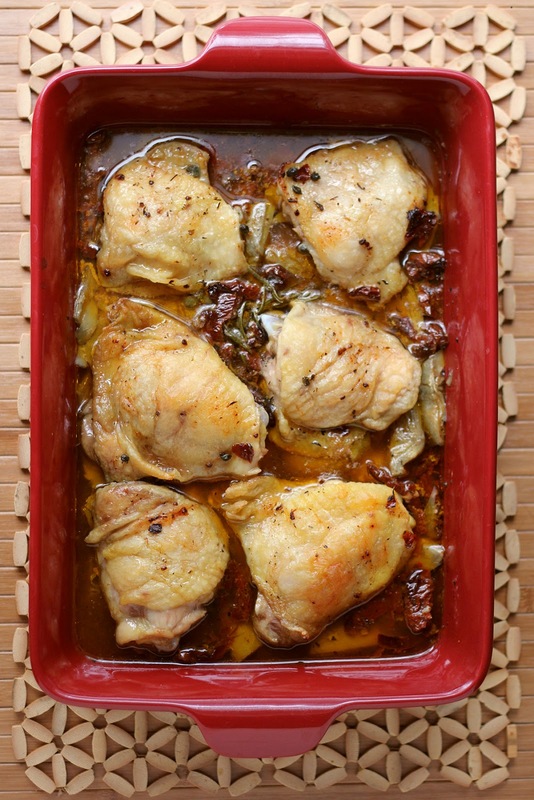 For this recipe, since I used chicken thighs, I could have used red wine, or some of the other flavors as well. Arrange the artichoke hearts on the bottom of a 9x13 pan. If you have a pretty pan, you can serve directly from the pan. You know, in case you want to do that. Add the sundried tomatoes (reserve the oil), along with the capers, wine, chicken stock, and rosemary. If your stock wasn't salted, sprinkle a generous pinch of salt on top. Arrange the chicken on top, skin-side up, and drizzle the remaining oil from the tomatoes on top. Bake at 350 degrees until the chicken is cooked through and the skin is golden brown, about an hour. Serve from the pan, or pile the thighs on a serving platter and scatter the artichokes all over. If you like, you can remove the chicken and vegetables from the pan, skim off the excess fat, and thicken the sauce with a bit of cornstarch or flour. This post was sponsored by Holland House, who provided product and compensation for recipe development. All words and ideas are mine.